Area Required: 7 metres x 14 metres. Extras: Three (3) kids rides all in one activity area. A cleverly built trailer that lies on the ground hydraulically with three children’s rides. This is a safe, stable platform with no trip hazards. 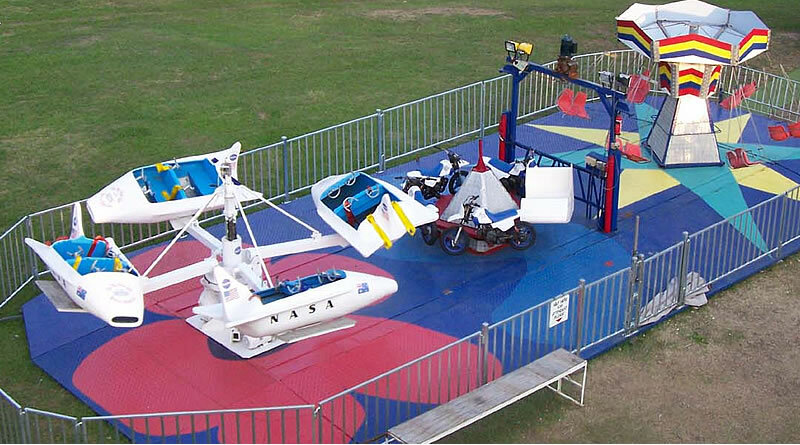 The Kids Zone three-in-one consists of the small Chair-O-Plane (this ride spins in a circular motion lifitng 12 children half a meter into the air), the mini motorbike ride (takes 6 children on a safe yet thrilling motorbike ride) and the hydraulic space shuttle ride (spins then lifts 16 chidren into orbit before coming back to land).